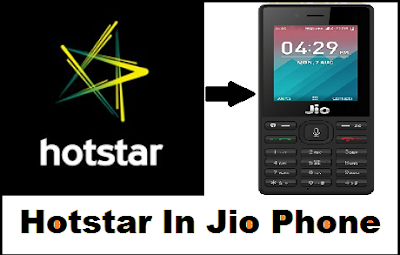 Hotstar In Jio Phone: Hello guys welcome to our jio guide blog. Do you want to watch the IPL latest T20 2019 on your jio phone. Then you are in a correct place just follow The below steps and watch your favorite T20 match live on your jio phone. First of all IPL T20 2019 is telecast by Star Sports so that you need hotstar application to watch live IPL 2019 on any smartphones. Jio phone supports many jio applications like jio TV and jio cinema etc. In jio TV app they provide live IPL in the past years but as of now they only telecast it on Hotstar app. Jio phone is one of the largest mobile phone which is used by most of the Indian people. This jio phone is released by reliance jio. To get more customers in jio network they released this 4G featured phone. This is not like any other featured phone this has many features like 4G Volte, HD voice and video call and much more features. Reliance jio also launched many application for jio users. Those jio tv, jio cinema, jio music and etc. Initially these apps are released only for jio phones then they hav released it on android and ios smartphones now you can use this apps on PC/laptop. To know more check below. At the time of jio phone launch it does not support Hotstar app current update version of jio phone supporting hotstar application to watch all star family events and channels. If you are using the old jio phone which is initially launched then try to update your jio phone kai os. To know how to update your jio phone kai os visit the below link. How to Update Jio Phone Kai Os? Once you have updated the current version of jio phone do the below steps to watch IPL 2019 on jio phone. First of all open your jio phone and click on the main menu. From the list of application select jio Store. In that jio Store it will show all supported applications jio TV, jio cinema, jio switch, jio music, and etc. From the List of application I can see Hotstar application. Just click on the Hotstar application it will start download. Once the download completed just open the Hotstar and watch IPL T20 2019 on your jio phone. Also Check: How to watch JioTV without Jio Sim? That's it this is a way to install and watch IPL 2019 on jio phone using Hotstar application. if you have any doubts related to jio and its other application and devices please let us know in the below command box. Provide you the best solution as soon as possible. Thank you for your visit guys.